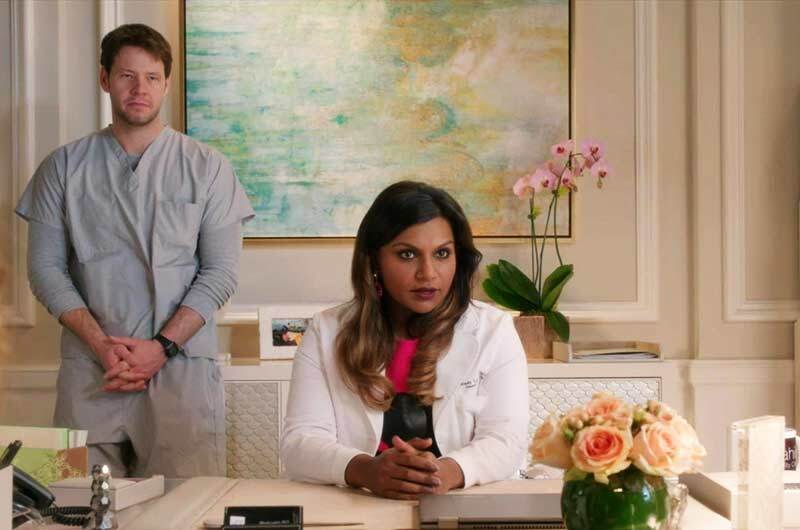 Ike Barinholtz, Mindy Kaling ©2015 Fox. 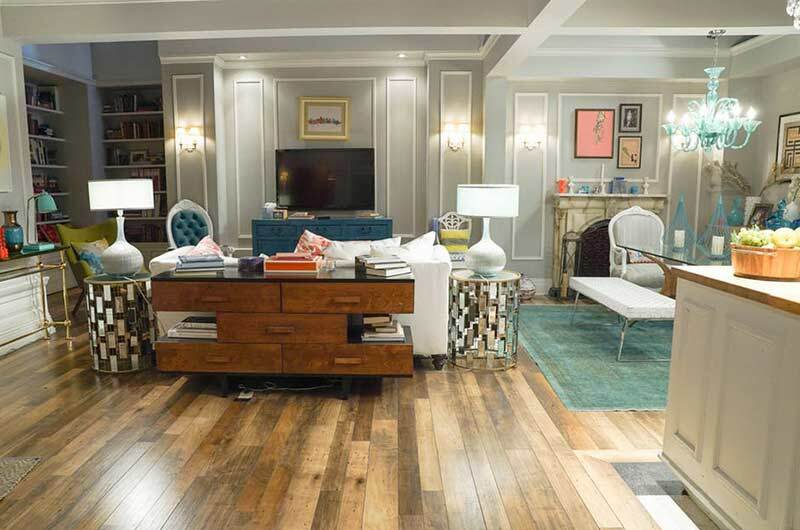 Mindy [Mindy Kaling] finds that it takes a while to build a new practice, but she has a beautiful space for it! Everything was taken away and replaced, including the food! 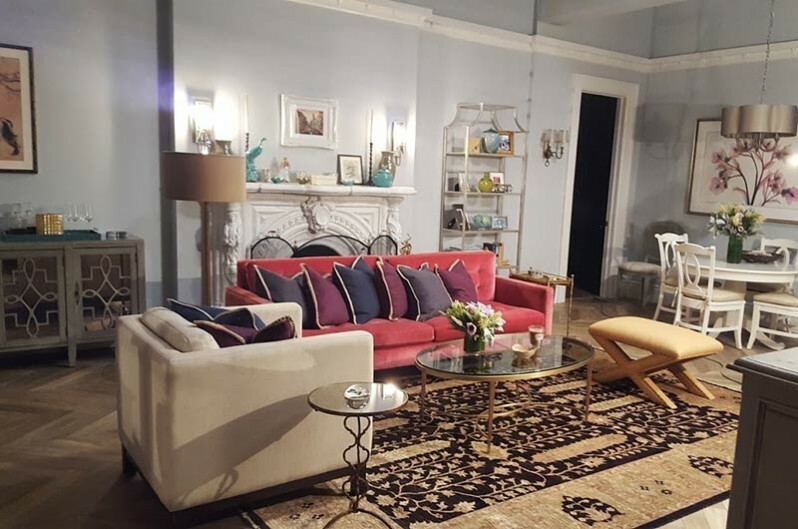 Mazuer and Contreras had waited to find the perfect set to use this pink sofa from Warner Bros. and they did! Check back in September when the Mazuer and Contreras team will bring us more fab sets for the final season! Meanwhile, read the great notes they gave on the sets you see! 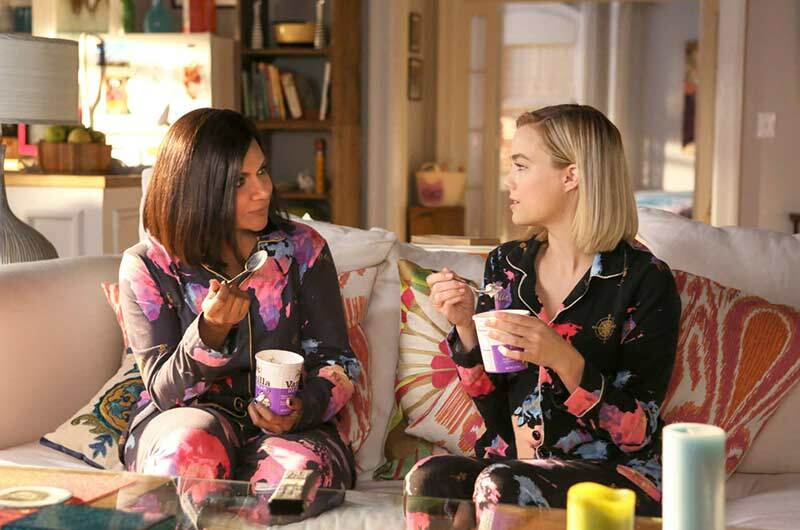 Mindy Kaling’s popular rom-com about an obstetrician/gynecologist trying to balance her personal and professional life took a leap at the end of this season when serial dater, single mother/doctor Mindy Lahiri got married! Who knows what the final season will bring in September! 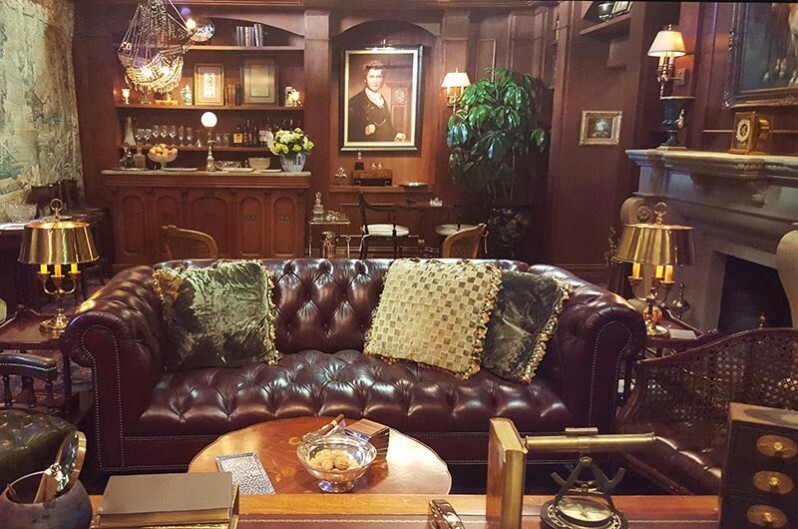 So we thought we should take a look at some of the recent sets as this season ends. 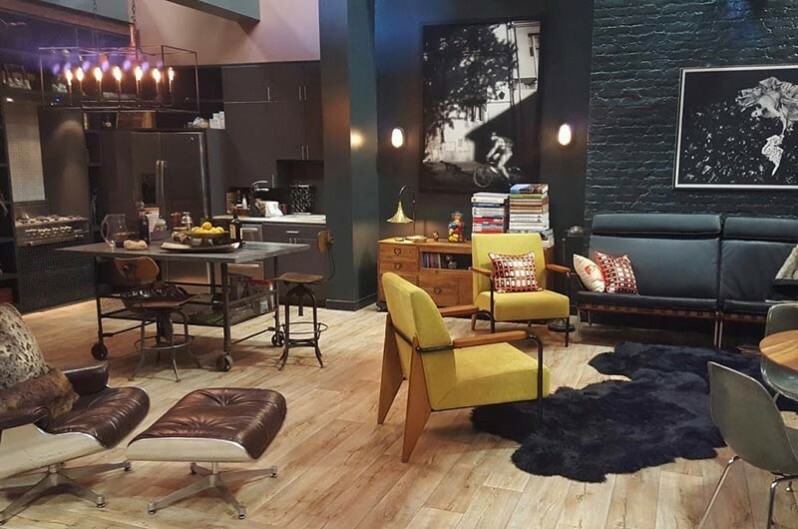 Set Decorator Lori Mazuer SDSA and Buyer Natalie Contreras SDSA are both on other projects during the hiatus, but we caught up with them for a brief look! SET DECOR: The two of you have worked together on such varied fare, from the haunting additional chapters of the INSIDIOUS to the Andy Samberg comedy POPSTAR: NEVER STOP NEVER STOPPING to additional photography on the Sci-Fi feature GEOSTORM due out this October and that’s just a few of the films! Natalie: Lori and I jumped in on Episode 3 in Season 3, but we have known each other since 2009. Through those years of working on commercials, features, and television shows, we definitely have a shorthand way of speaking. Lori is a great decorator, and she loves to layer. We both go through research together to get inspiration, we discuss colors and style, the overall feel of the character. When I shop for pieces I like to throw in what I call "surprises". Sometimes she laughs at me and asks me what was I thinking, but most of the time she likes the little surprises I show her and we go with it. She trusts me, and I think that's invaluable when working on such a fast-paced show with many variables. And she loves what she does, which makes it really great to bring characters to life through the sets. Do you even get to see each other for more than a few minutes, or are you on the run the whole time? Lori: For the most part we try to regroup every morning and end of the day. We are definitely on the run most of the time! We always say we will meet for lunch but most of the time that doesn't happen. Whenever possible we try to have our end-of-the-week dance off in our office...just to celebrate the weekend! The series made a major move from Fox to Hulu! How did that impact set decoration? Lori: Hulu bought 26 episodes for Season 4. We basically started in July and shot straight through until May, with a few small hiatuses in between. It was tough, but we couldn't have asked for a better crew to help carry us through, and the budget stayed the same, which was helpful. 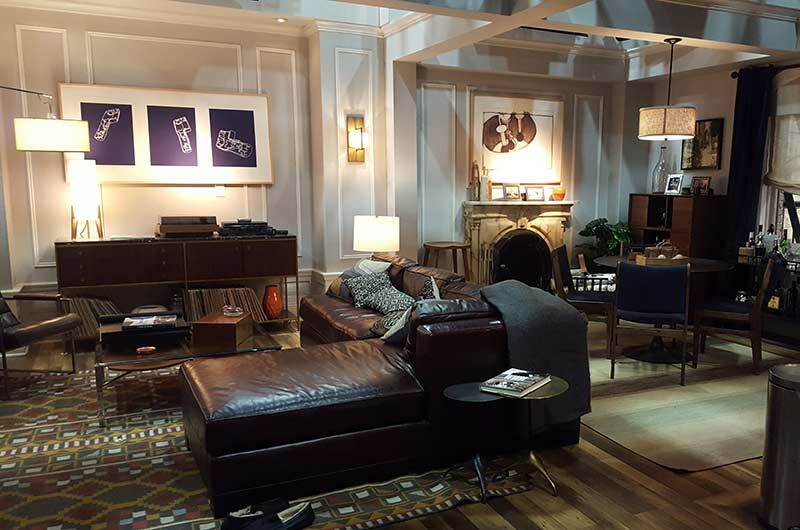 We got to do some great, fun sets for both Season 4 and Season 5 and are looking forward to what will come for the final season! 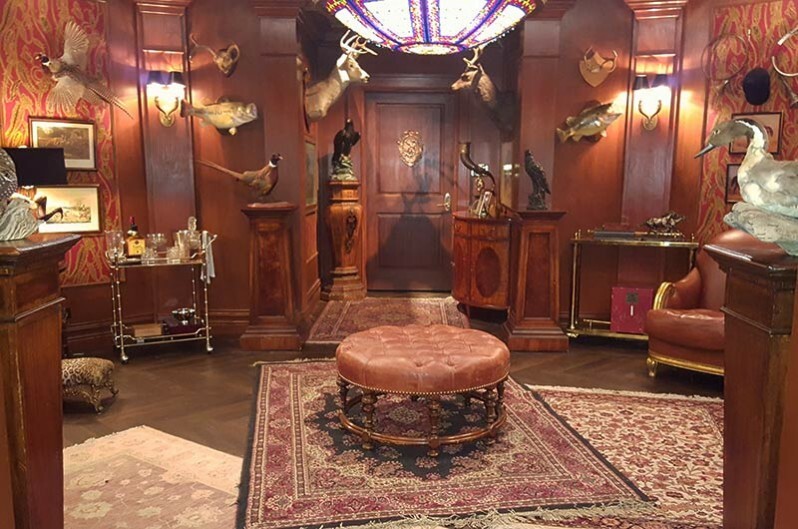 Several of the main characters’ sets were strongly established in previous seasons by the set decorators preceding you,* so did those sets require major changes or were you basically focused on just adding in elements to those? Natalie: Since we hadn't been a part of the main characters’ sets from the beginning, we went in adding just a minimum of changes. 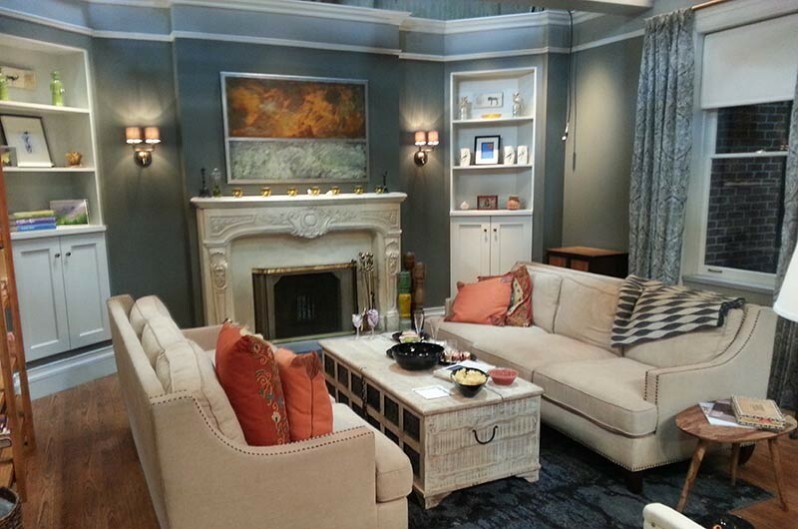 Then in Season 4, Mindy asked that we change a few things in her set, which we loved. For example, in her bedroom we paid homage to her study in the Bay Area by adding art of the San Francisco Golden Gate Bridge. U-Frame-It framed it in a beautiful candy orange. We added a bench at the foot of the bed, changed out her bedding, and added a Johnathan Adler dresser. Creating Morgan and Colette's apartment was also really fun, because of Morgan's love for dogs and Colette's Southern background. 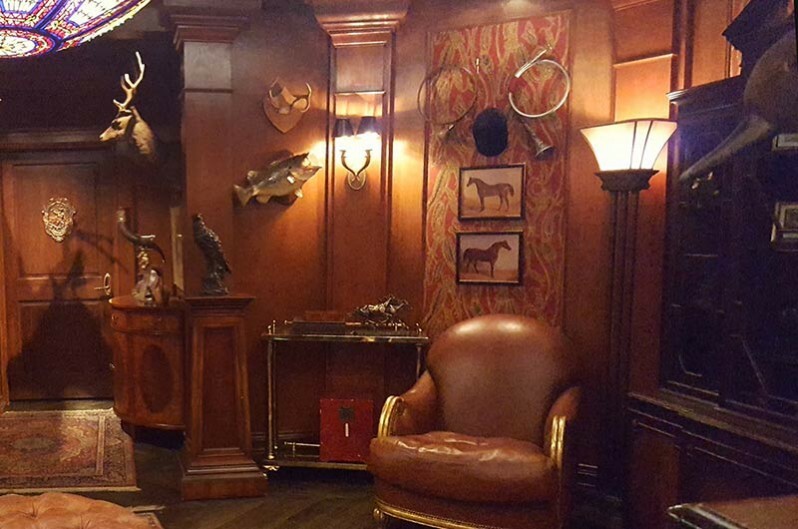 Jody was a new character in Season 4 and that set was also so much fun, especially his trophy room. Lori: Yes! And in Jody’s library, there are paintings of old plantations and Antebellum mansions that I don't think we ever really see on camera, but hopefully help the actors feel the essence of the character. For that same reason, there is always a dish of pecans on his desk. We love developing Jody's world because its so over the top extravagant and worldly. Were palettes assigned to characters? Lori: Always. 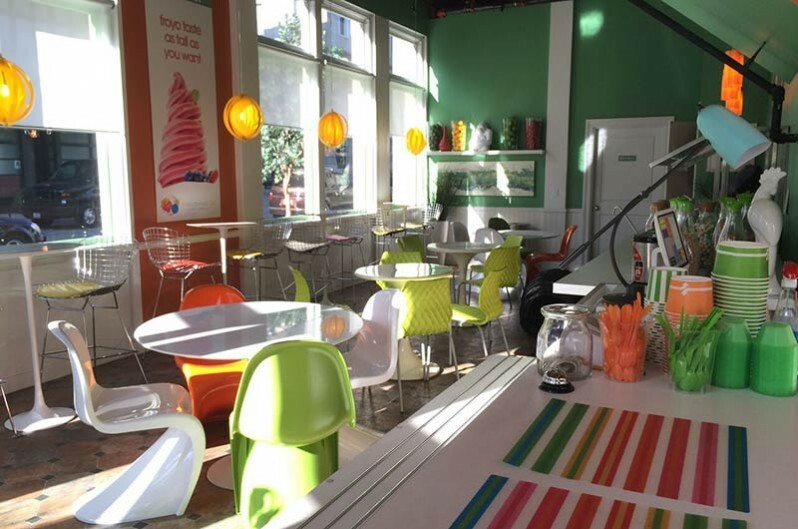 Production Designer Kathleen Widomski and I will talk about what colors we feel best suit each character. Often we gravitate to greys, dark blues, browns for our more masculine sets. 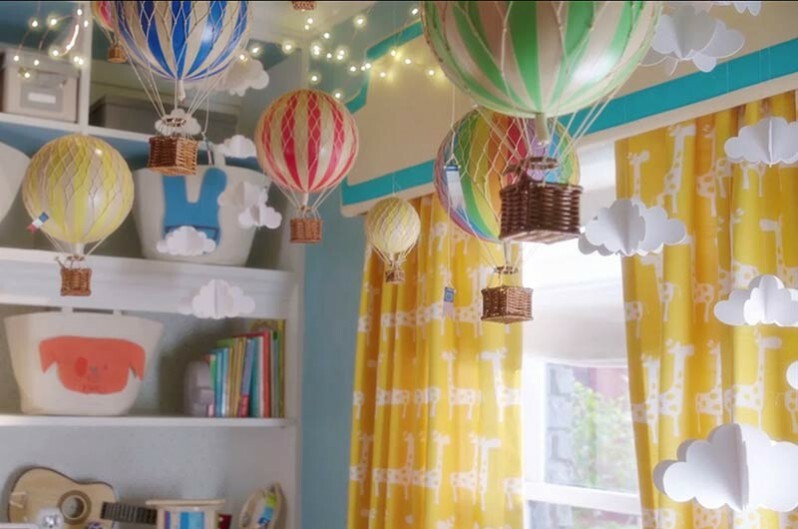 I try to stay clear of doing any sets that are ultra colorful like Mindy’s apartment. That’s her world and we try and keep it distinguished from the other character sets. 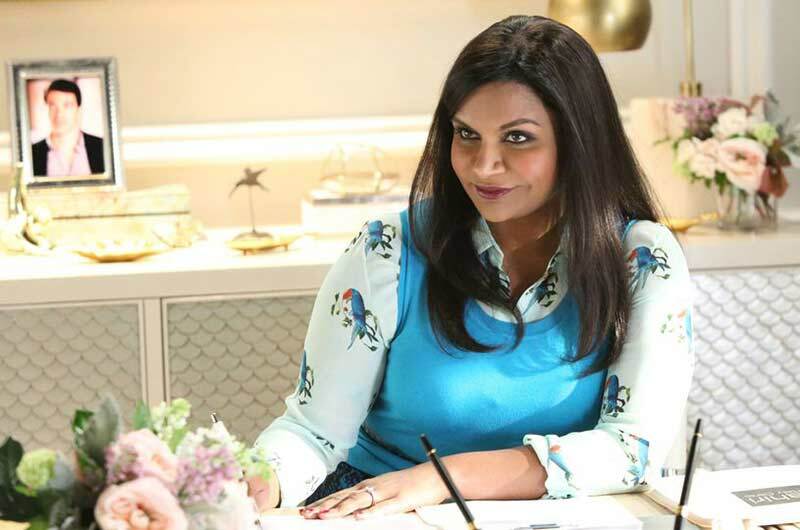 Natalie: Mindy Kaling has incredible style with a great sense of humor. She often would bring us art she would find from everywhere and ask us to put that in her apartment. 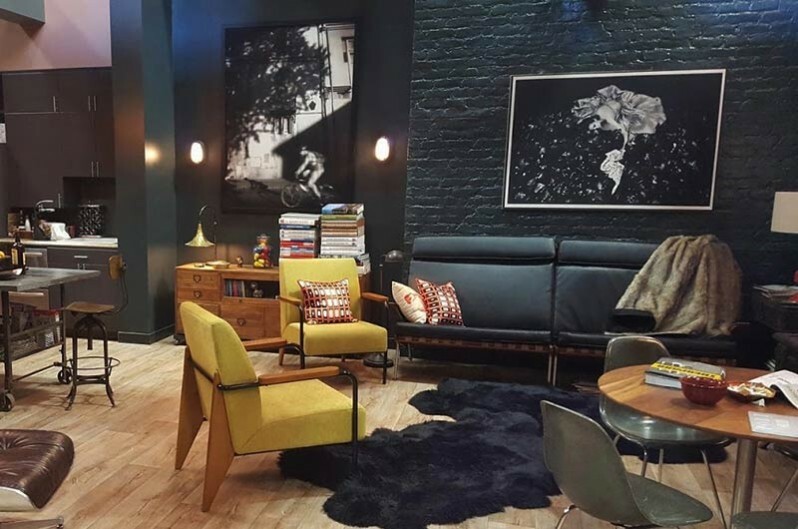 Her apartment is already so stylish and colorful. I think the art speaks to both her and her character. 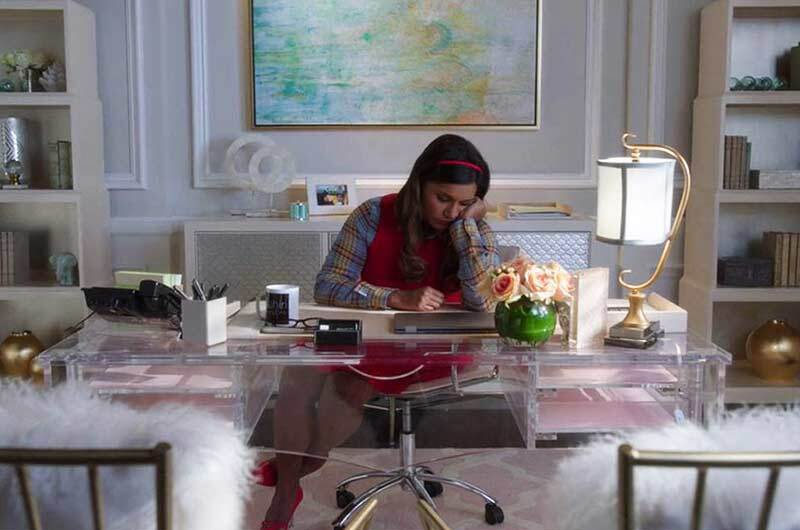 Mindy certainly moves around – Haiti, San Francisco, her childhood home in Massachusetts, and of course, the city at the heart of it all, where the series begins and where she always returns, New York! 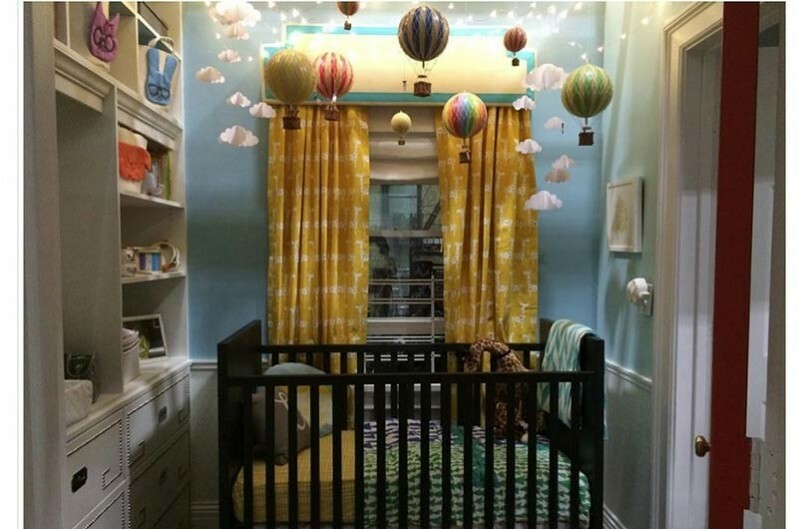 Natalie: Lori and I had the opportunity to create her childhood home, her dorm, her fantasy apartment with her child Leo's various stages in life, and her fertility practice. They were all very different, especially her childhood home verses her parents’ apartment in Mumbai. Her father is a doctor and her mother an aspiring actress who gave up her dreams when she became a mom. So Mindy's childhood home was very comfortable, very homey, made with love and style. Her dorm was another story. We had to bring the Mindy-style to a drab dorm room with typical dorm furniture. We refer to it as "Mindy-fy" it. Because of course, she would add her style no matter where she goes. Also, we’ve seen her go through myriad aspects of the dating scene and then being a single mom, please tell us about this set-wise! Natalie: By the time we stepped in she was already dating Danny full time. So what we did was show elements of her moving in to Danny's apartment. It was a big deal. 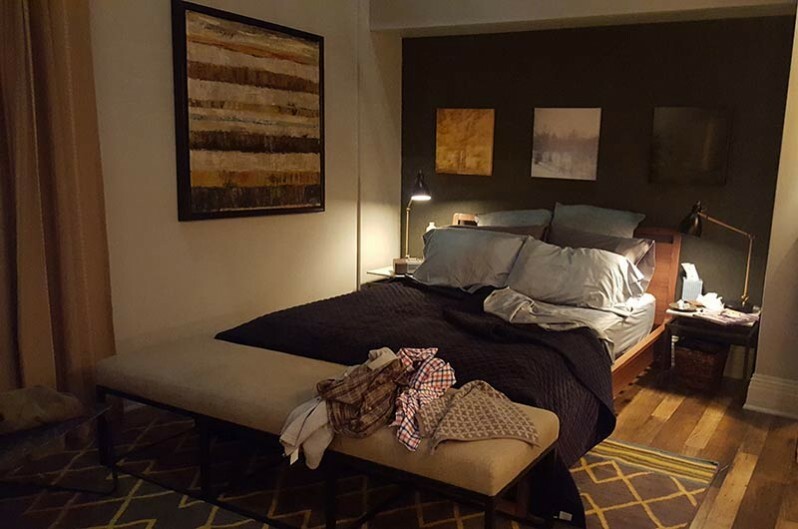 Her character purchased a small end table that lived in his apartment for the remaining of the show until they broke up. And then of course there's the change when she becomes a mother. When she clears out her closet in Season 4, it was so bittersweet. The story line was so sad, seeing her cry on the floor in her apartment knowing they are going to break up, but also it was so great because what we did to her closet to accommodate Leo was so really sweet. Lori: Shulman and Associates was pretty much already developed by the time we came on board. The dressing and artwork in the nurses’ station is more traditional with the idea that Mr. Shulman is an older guy with more traditional aesthetics. We built the fertility clinic early in Season 3. Kathleen and I had the idea of doing a white tone-on-tone set with very soft colors for accent. 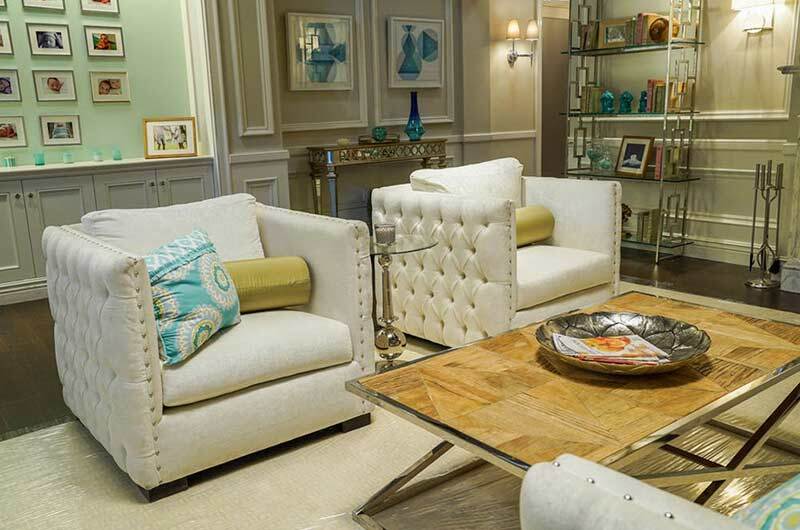 Mindy wanted a set that felt like a spa and was a bit more extravagant than your typical fertility clinic. Almost all the furniture was a variation of white. Most of the artwork is in soft blues and greens with a little bit of light pink. 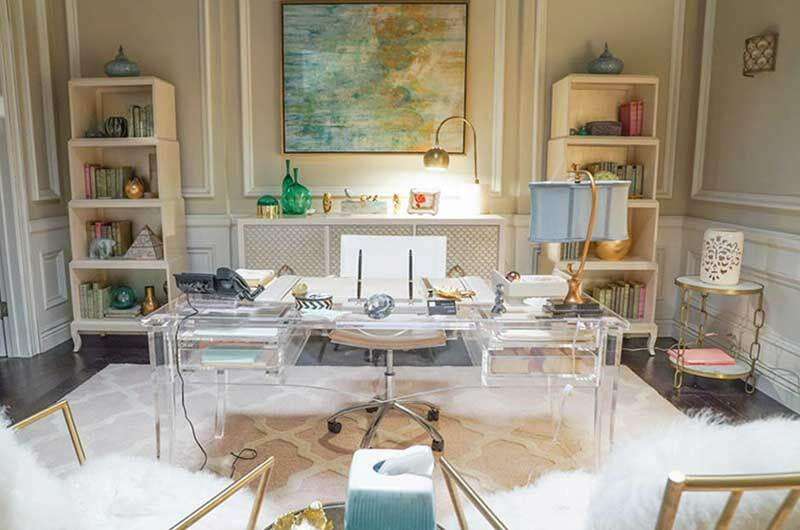 This was completely different than her apartment and office in Shulman’s. 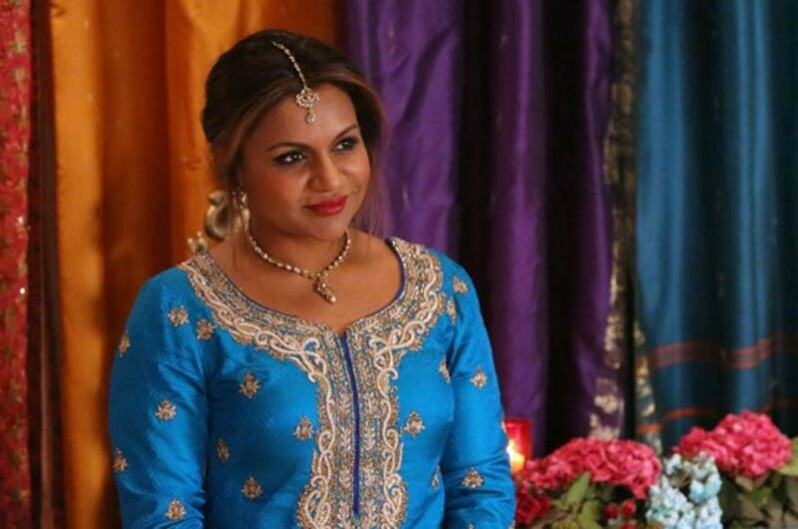 Whenever I see Mindy on that set, I think she looks so beautiful because she pops so wonderfully in her colorful attire against the pale background. Natalie: We had months to prepare for that set, and we didn't waste one second of that prep time! We searched high and low for pieces that were large enough and feminine enough but due to our budget and schedule, we just couldn't make that happen. So we had the sofa, two club chairs and desk manufactured. 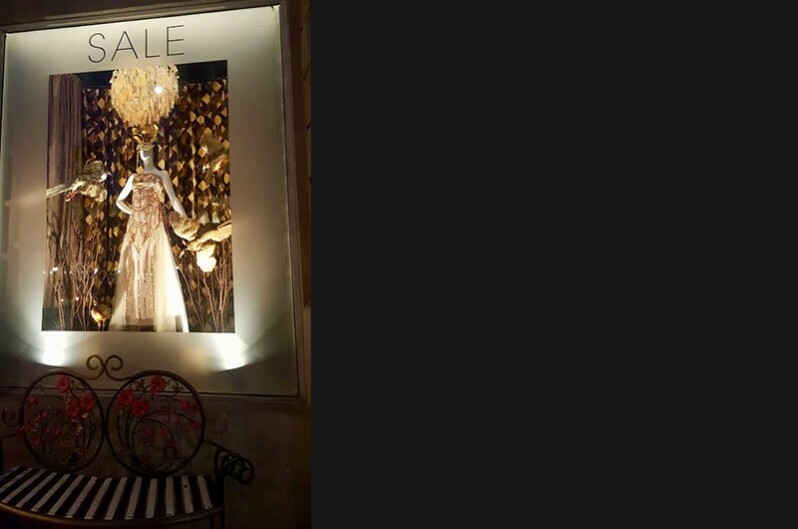 Mitchell Gold and Jonathan Adler could not have been more helpful in getting us the right chairs and étagères. 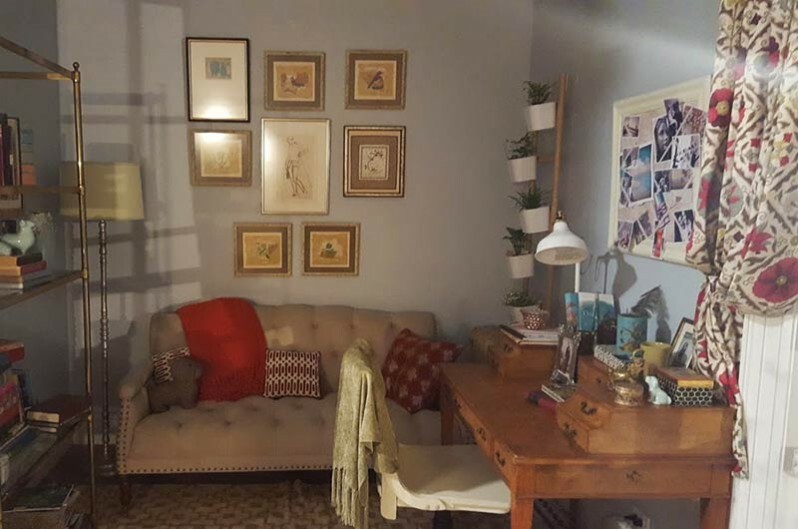 We filled in the blanks with Bridge Props, Nest and Art Pic, as well as local stores. We worked day and night to get this set perfect. And it really paid off. Mindy absolutely loved it. And so did we! 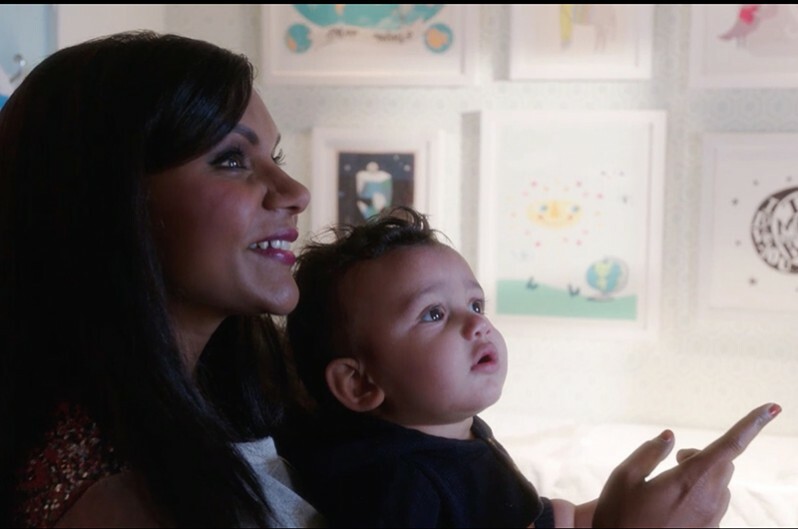 Natalie: Mindy always finds a way to be right in the middle of it all. One set that sticks out in my mind is the Russian House in New York. It's so iconic, and we had three seconds to sell it because it was such a quick shot. So we had to be very strong in our choices. 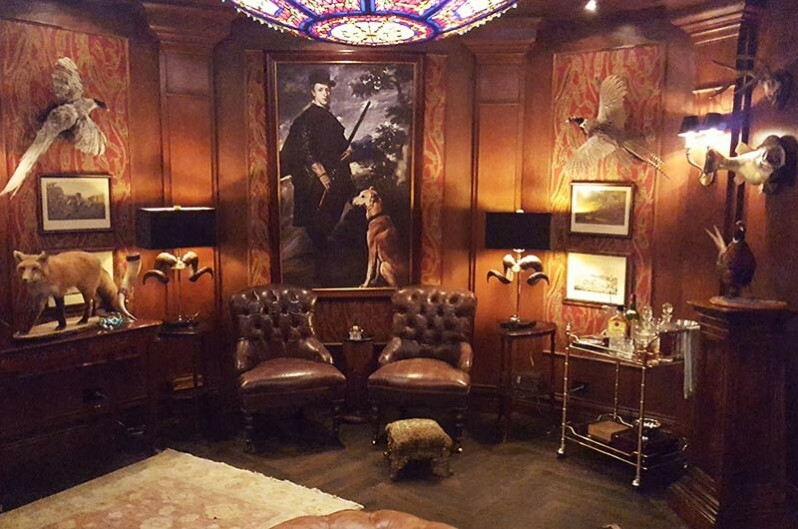 Another iconic location we re-created was the SoHo House. We had great research and rented many pieces from Omega and Bridge Props to recreate this prestigious and well-known club. Natalie: The Mumbai sets are favorites of mine, because we were able to build up this world all around us...from the art, to the greens, to the food and spices that fragrant the air, down to the cars that drove through the streets. It was massive. We did the exterior sets on the backlot of Universal, and we searched high and low to make them perfect. Art Department again had great research for us. And when it was all finished, it even smelled of a market place in India. Probably one of the biggest compliments came from a friend of mine who spends half the year in India. I asked her to watch the season finale. She sent me a text and said, "You nailed it, Congratulations." That felt so good because our team works so hard on that, and even with the challenge of a rare rain storm and our set turning to mud, they went in there and knocked it out of the park. Our whole team "nailed it". Natalie: Yes! 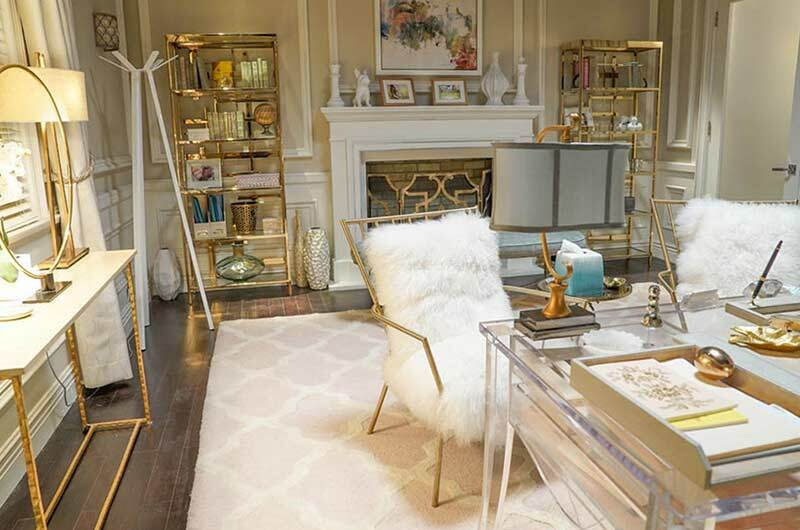 In the episode when Mindy wakes up as a white man, we had to completely turn over her set to avoid building the entire set as a swing set. So, every room had to be addressed right down to the toiletries in the bathroom and the food in the fridge. 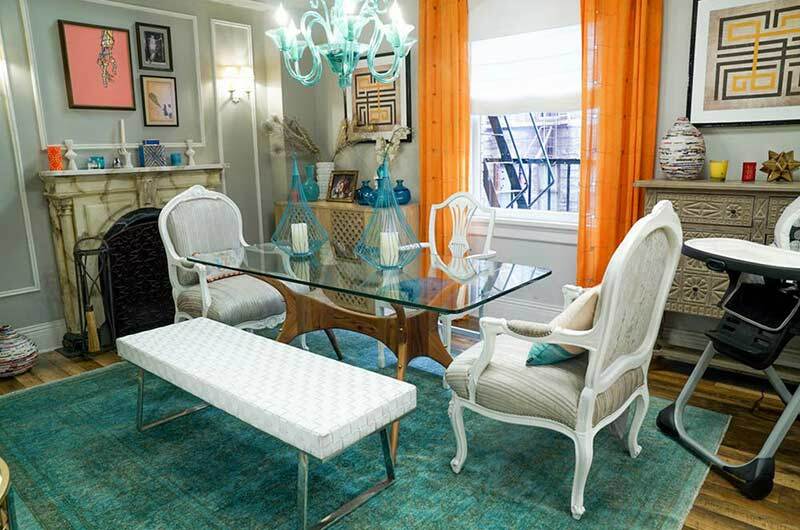 We wanted the apartment to be a little more sophisticated and definitely in more neutral tones as oppose to Mindy's more eclectic and colorful palette. It was all very masculine. Objects, ZGo4, and Warner Bros. Designer Collection were perfect for this look. 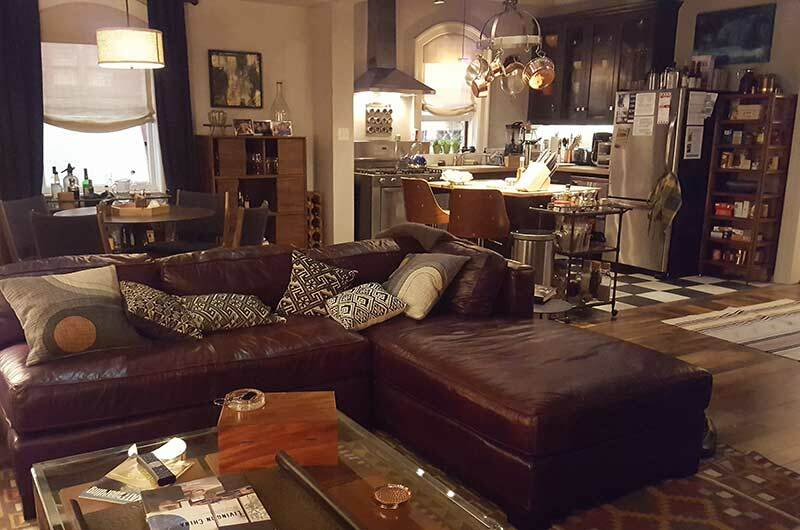 Lots of really great leathers and Mid-Century modern furniture were used. 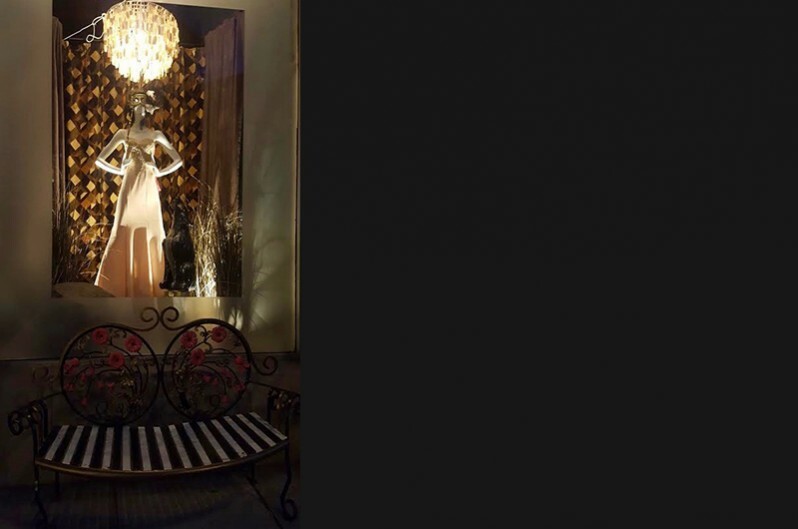 It made the whole room transform into a warm environment. You can almost smell the cologne looking at it. 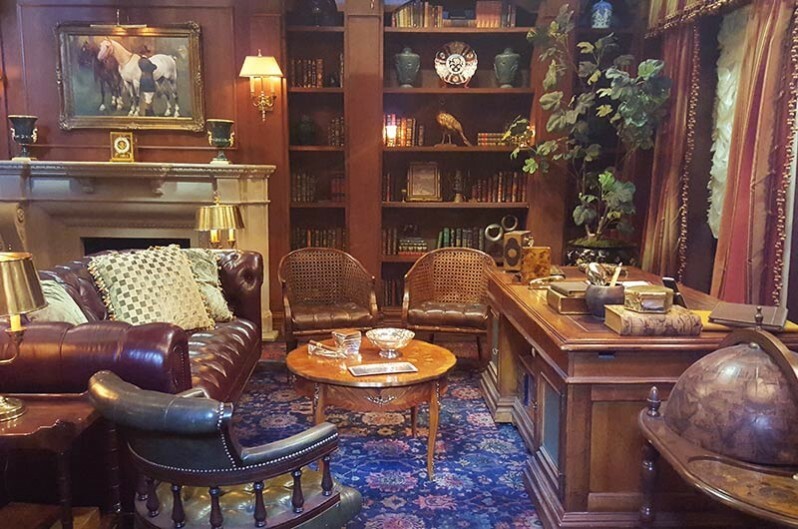 We secretly hope that set comes back! Lori: Jonah was a successful hipster photographer that always had models hanging out smoking cigarettes and partying. We wanted the walls to be darker to give Jonah a more mysterious appeal to the audience. This is his working studio where he lived and also brought clients. On the other side of the room, we had a seamless set up with a camera, and had tons of his large print photography. Natalie: Yes, Ashley is a stylish Southern girl now living in New York. Lori and I were brainstorming what we wanted to use in her set and this was clearly a case of our shorthand way of communicating. She had said, "Oh, you know that pink sofa..." And immediately I replied, "Yes, in the basement, that would be perfect." Now to us, that conversation had all the blanks filled in, but to the listener, one would ask, "Did I miss something?" We had wanted to use that pink sofa from Warner Bros. Designer Collection for the longest time, and finally this was the perfect set! 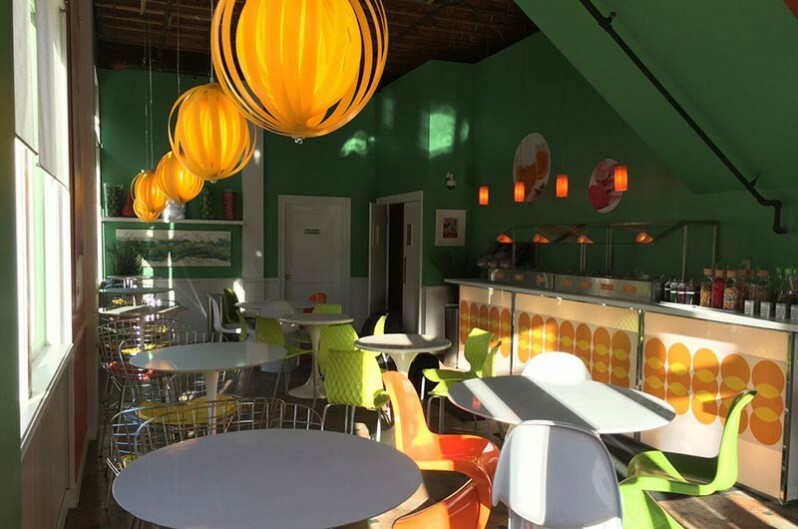 We wanted it to be eclectic, feminine, with a hint of Southern charm and a whole lot of New York style. She wrote a blog, which meant she would have to have a very comfortable space to write. So, we designated a little area in her apartment for a home office, as well as have other areas for her to sit comfortably. 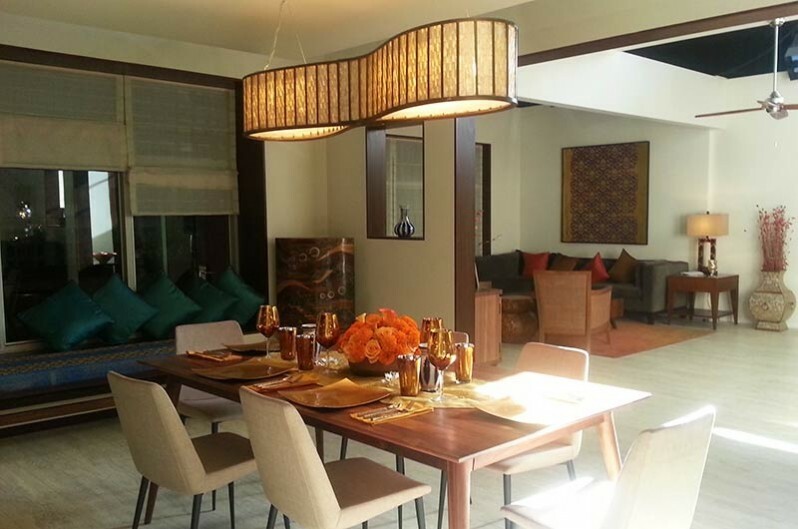 We blended contemporary style with vintage pieces to create that BoHo Chic look. 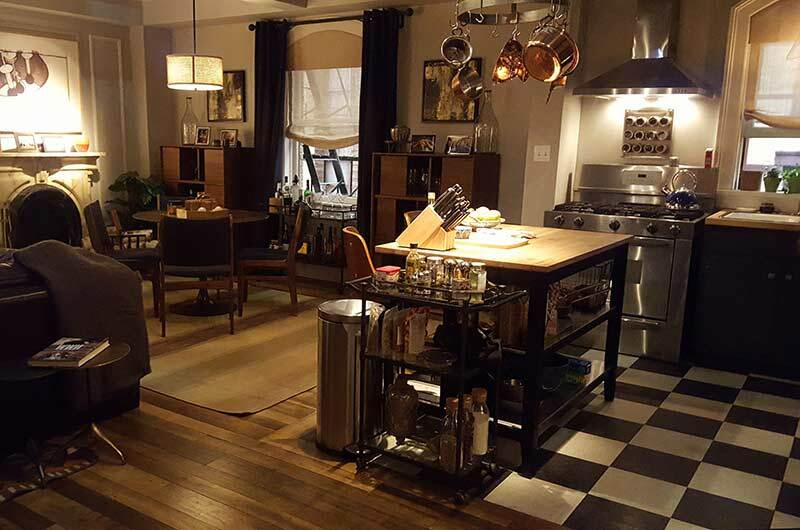 Lauren Cohen, who played Ashley, commented how fun her apartment was, and that of course always makes you feel good about your choices. I think all the sets we do are fun. Let's face it, how can you go wrong re-creating anything that lives, breathes, and becomes New York?! It has such an energy to it and that's what we hope we bring out of our sets.